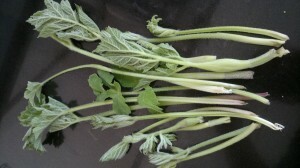 Edibility – 5/5 – young shoots, green flower buds – the finest tasting vegetable in the UK in my opinion! Seeds – 4/5 – pickled when green or used as a spice, especially when dried. Mature leaves – 1/5 – Generally best avoided, but can be fermented. Be sure to read warnings on handling below. Not recommended for eating raw. Identification – 3/5 – one of the easier of the potentially deadly carrot family to ID, but caution still necessary as the tasty young shoots are not fully formed. Learn more about the carrot family on my Introduction to the Carrot Family for Foragers. And remember – we are talking about common hogweed here – not giant hogweed, which should not be eaten or even handled – see below. Care should also be taken when handling common hogweed – see below. Season – March – September, seeds all year. Leaves: Large, 3-5 lobes, hairy, serrated. Stem: Hairy, grooved, hollow, striated, starting purple (not blotchy), becoming green, new joints and flower buds emerge from papery ‘parcels’. 1-2 metres tall fully grown. Flowers: White to pink, 5 petalled, 15-30 rays arranged in umbels of up to 30cm. Petals on outside of umbel usually larger. From a distance, I recognise hogweed by the flattened tops of the umbels – though this is insufficient for full identification. Common hogweed flower, July. Note the larger external petals. Care should be taken when picking as chemicals in the sap can cause phytophotodermititus – especially in strong sunlight – gloves recommended for the thin-skinned, especially children. This is less of a problem when picking the young shoots and flower bud “parcels” – which is what you’re after. During summer, as the plant matures, the sap becomes still more phytopohototoxic and I restrict my handling to just snipping off seed umbels. Unfortunately instances of children getting burned after playing with common hogweed are not uncommon (the hollow stems make appealing pea shooters) – please educate them on potential dangers (see in the comments section below for further discussion of this). 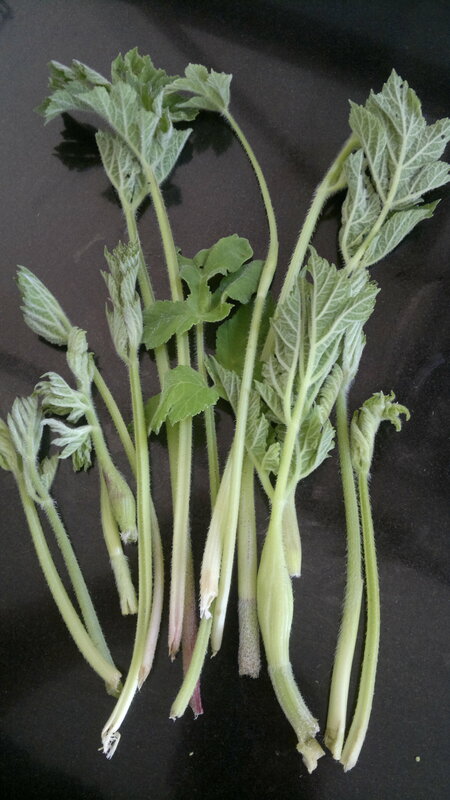 Young hogweed shoots are one of my favourite wild vegetables, reminiscent of asparagus and parsley and so much more. They grow back after harvesting and can provide a steady crop throughout the summer. Fried in butter until almost crisped and caramelised, they are unsurpassed and best eaten as a stand alone vegetable. Stir through some sorrel leaves at the last minute to add some acidity to cut through the butter. They require no seasoning, having a rich and balanced flavour without help. The unopened flower buds are also delicious and come in their own wee packages which means you can steam them without losing any of their sensational flavour – a glamourous steamed accompaniment to fish. Add them peeled to stir-fries, deep fry in tempura batter or to pickles. Older leaves are not so appealing, but are still edible and make an excellent addition to a stock pot. When the plant starts to die back for the year, you will still be able to harvest the flat, round seed pods which have an extraordinary taste. I have heard them variously described as tasting of orange peel, cardamon, coriander, ginger, liquorice and burned cedar – probably a combination of all of those is a fair reflection. Sensational. When still green I add them as “flavour bombs” in curry mixes or pickle them to eat salads with smoked eggs or pickled fish. Once they have dried out the flavour mellows a little. Try infusing them in hot butter then discard and use the butter like ghee in curries or for cooking fish or sauteing sea beet or other veg. Dried out seeds can also be ground and used in baking and make for a sublime parkin. My friends Kath and Liz of Kather’s Kitchen and Forage Fine Foods came up with the original recipe and here it is. I sub most of the ginger out in favour of ground hogseeds, but you may prefer to start with the original recipe. The dry seeds also work extremely well in drinks and cocktails. Try infusing them into vermouths and gin, or adding them as a mulling spice to winter warmers. 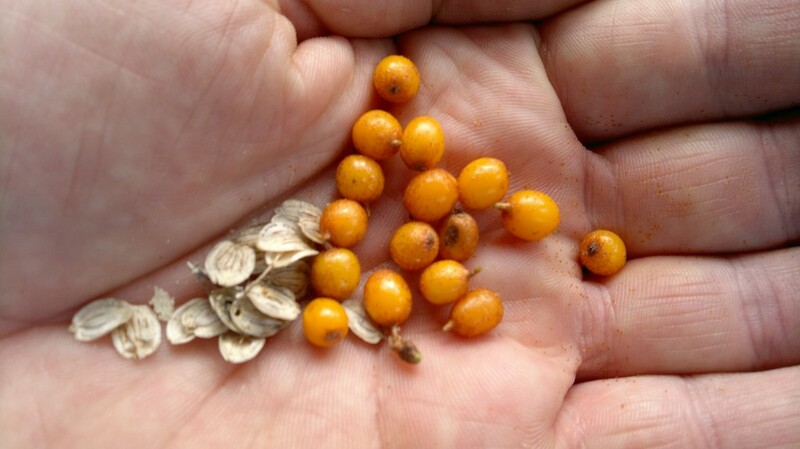 I like the seeds best of all as a wayside nibble – just one really gets the taste buds partying – especially with a single sea buckthorn berry! Kapow! I add hogweed seed bitters to my wild whisky sour cocktails. Be sure not to mistake common hogweed for its big brother giant hogweed (heracleum mantegazzianum). This is not edible and is aggressively phototoxic. It grows much bigger – up to 5 metres – and has much more aggressively serrated leaves and a purple blotched bristly stem. A truly remarkable plant-triffid that you can almost see growing! Look out for previous year’s enormous canes and skeletal flower remains when leaves are just emerging. The three pictures below are all of giant hogweed. Dear Could you tell me where to buy common hogweed. I live in Belgium. Hi Antoine, I’m afraid I have no idea where you might buy hogweed in Belgium. It is very common in hedgerows in the UK and most people who know that it is good to eat, know it well enough to pick their own. You could try Miles at http://www.forager.org.uk/ – he supplies restaurants with wild food and may be able to help you out. Can anyone tell me where I could buy Wild Hazelnuts Seeds (Corylus avellana ( non cultivar)). I’d check out http://plantsandapples.co.uk/ first. If they don’t have, i’m sure they’ll know where to get. Hi, I found two different plants that I believe are both hogweed but the leaves look so different to each other… Is this possible?! Yes, I think both are hogweed (h. sphondyllium), but there are 8 subspecies of it, so you might have one of them. Also, plants of the same species can vary somewhat. A phenotype results from the expression of an organism’s genes as well as the influence of environmental factors and the interactions between the two. If you consider the variations in human phenotypes, no wonder there is some variation within plant species! There are some issues for the forager here of course – especially with species that already exhibit some irritant traits. I’ve had no trouble with any of the variants I meet in Galloway, but know a forager down south that has noted a high incidence of adverse reactions. Careful harvesting and consideration required! My 11 yr old son is currently undergoing treatment with plastic surgeons for a severe 3rd degree plus toxic burn on his hand, believed to have been caused by contact with common hogweed. See phylophotodermatitis . We know of several other cases locally. It can take months to clear up, and the affected skin remains light sensitive and has to remain covered for 6/7 YEARS. My son realises how lucky he is when others have such a widespread area, but his is a very severe burn. He has to spend his summer after he leaves primary school with his hand fully bandaged, avoiding any contact with water, and no sports. For a county level tennis player and athletics team member this is not easy. Our self-catering holiday house with pool will be pretty tough. Be very careful what you touch, and perhaps reflect a little on what you advise others to touch. Burn mother. Thanks for your comment and i’m really sorry to hear about the injury to your son. I hope he make a full recovery and his sports and fun aren’t too adversely affected in years to come. I understand this must be distressing for him and you. The level of burning he has suffered sounds closer to reports I have heard from giant hogweed after people have handled or strimmed it during the summer without adequate protection. But children have thinner and more sensitive skin and I have heard of issues with common hogweed too. As mentioned in one of my comment replies above, there are several different strains of common hogweed throughout the UK and discussions with fellow foragers and botanists seems to show a higher incidence of adverse phytophotodermatitis in the South. This may reflect higher incidence of aggressively phytophototoxic strains as well as higher population densities and also higher levels of light intensity. The burning sap seems to develop in older specimens of all hogweed as they reach maturity and photosyththesise more intensively. This is the stage at which the foliage is of least interest to foragers but unfortunately when they are most appealing to children for making pea shooters, swords etc from the stems. With regards to your final comment, yes, I am very careful of what I touch and what I eat, and advocate this approach to anyone interested in foraging. Education, information and knowledge are the best tools against misadventure by young and old. The shunning and vilification of plants is more likely to lead to misinformation and ignorance. I have talked about, harvested, cooked and eaten hogweed with school groups with no adverse consequences. They learned about a fascinating and very useful plant, and how to mindfully harvest it, play safely near it, cherish its uses and respect its potential dangers. Without your advice to “reflect a little”, I already reflect deeply on the information I share on this website. You will notice several warnings on safe identification and handling if you read the beginning of this page. Again, ignorance leading to unfortunate incidents is sad and I hope by sharing sensible information this can be reduced. I hope your comment here will help increase people’s awareness of potential dangers, especially to children. I have just added an extra line with regard to children to the text too. Finally, I am reminded of an incident from my youth. While picking mushrooms from a heathery banking, I suddenly noticed a lot of insects around my head. I had inadvertently stumbled on a bee hive. I was stung dozens of times. I am now very mindful of bees, but the incident sparked a fascination in me for their life cycle and usefulness in nature that has enriched my life ever since. I hope that this unpleasant experience for your son may inspire interest in, and respect for, plants, rather than fear and mistrust. Good speech Mark. Poor lad! Some people have worse effects than others. I myself have many times wandered through stacks of Hogweed to no ill effects whatsoever. Also I’d like to say Human Beings have hurt and devastated Nature a million times more. If so many Humans had not gone away from nature we would know what to teach our children to keep them safe! It’s the same with anything.. Fire for example,,, Dangerous but extremely useful. You have picked up on such a vital point Dean. How ignorant most folk are now of all things natural like being exposed to the natural world including dirt, bacteria, the elements and hard physical work from an early age. The world has grown soft and fearful. I’ve gardened all my life, never wash my hands whilst doig so but eat my sandwich and cake with filthy fingers. At 63 I’ve never had a stomach bug – good genetics maybe but definitely helped by bacterial ingestion that has boosted my immune system. I too have been “burned” by hogweed adjacent to the public highway in St. Clement, Cornwall. I had cut some to remove it from a well-used area, when the stem was blown across the side of my face and neck. I had lumps appear under my skin and burning and itching, which lasted 3 to 4 weeks, and itching and dryness continue to be uncomfortable. I have informed the local council, and an officer has visited the area, which had not been maintained for over a year, I await some action. The hogweed had now seeded, so will continue to be a danger to the public in future years. I’d be surprised if the council were to take responsibility for “controlling” common hogweed. Its hyper-abundant throughout the UK. What an odd precedent to start destroying all plants that could conceivably harm a human. Where would it stop? Buttercups? Nettles? Brambles? GM maize? I hope your burn clears up OK and you use your hard-won knowledge to help educate others, rather than wage war on a plant that has many beneficial uses for humans and infinitely more for the natural world. I run a Forest School in West Sussex. Our grounds are covered in common hogweed in Spring through summer. No child has ever complained of any reaction to common hogweed, though I did find a blister on my hand the other day. I alerted the children to the danger. There were no complaints from them through the day. The blister/burn could have come from the hogweed. I’m not sure. There is definitely the possibility that individual plants are more toxic than others. I will let you know if there are any further incidences of phototoxicity here. Me, I have had my first taste just the other day–really enjoyed it! I also read on Plants for a Future that a sugar could be obtained from the stems. Have you ever tried it? Hi, Ah, good to know you and the kids are switched on to this. No, I haven’t tried the sugar thing – but I will! This plant just gets better and better! After my post last summer, I am very sorry not to have replied sooner. The seasonal appearance of common hogweed, and a friend’s query bring me back to this website. I am pleased to say that my son has not suffered any major damage or scarring following his severe burn after contact with hogweed. There appears to be no nerve or muscle damage in his fingers. He continues to have to wear a glove covering his hand at all times in daylight. This includes at school, sports, swimming et cetera, not easy for an 11 year old. We have had difficulty getting advice about how long he must keep this area covered. For Monica Wilde: we live in Oxfordshire; he has mild hay fever, had mild excema; no known food allergies . I would be most interested in hearing more about your research. I agree with Mark that education is the most important thing. My son was not specifically playing with or handling the hogweed. He just came into contact with it somehow in outdoor play in a rural area. Awareness is key. People need to know about this plant and the potential danger, then make decisions about handling it. Nicola i hope that your son now is okey! Based on your information, about your’s son burns that couldn’t be Common Hogweed. It can cause burns, but not so serious to be covered for 7 years. That was 100% Giant Hogweed plant, they are similar, and 7 years sensitivity is result of Giant Hogweed burns. Here in Aberdeenshire we have a lot of Common Hogweed on our smallholding and I regularly collect it to feed to our horses who absolutely love it. I am usually wearing gloves when I collect it but also wear a t shirt and collect armfuls of it and have had no problems with burns, and neither have the horses. Our local variety’s leaves are like a very large, hairy Ground-elder with 3 lopes and virtually no serrations. Hope this helps your study, it is an impressive plant that councils are spraying indiscriminately in the belief that it is Giant Hogweed, I have had council workers on our small holding spraying where I had just planted some Willow whips; they did stop when asked, seemed shocked that we did not want it killing off. Here in Aberdeenshire we have a lot of Common Hogweed on our smallholding and I regularly collect it to feed to our horses who absolutely love it. I am usually wearing gloves when I collect it but also wear a t shirt and collect armfuls of it and have had no problems with burns, and neither have the horses. Our local variety’s leaves are like a very large, hairy Ground-elder with 3 lopes and with slight serrations. Hope this helps your study, it is an impressive plant that councils are spraying indiscriminately in the belief that it is Giant Hogweed, I have had council workers on our small holding spraying where I had just planted some Willow whips; they did stop when asked, seemed shocked that we did not want it killing off. Thanks for the info Ralph, much appreciated. My 9 yr and 8 yr old son and daughter have had nasty blisters on their arms, tummy and leg after a camping trip in Malham (22-24/07/2014). They were making ‘boats/rafts’ out of grasses etc to race in the stream next to our tents and my son especially had used the stems from the plant that had a hollow, hairy stem and clusters of white flowers (which I now think may be Heracleum sphongylium). We had amazing sunshine for most of time we were there and little shade so used plenty of factor 50 suncream and wetsuits. I used Compeed blister plasters on my daughter and covered my sons blisters with dressings as that was more comfortable for them (+Aloe vera gel). The blisters have burst now leaving reddish/brown itchy marks. Neither my son or daughter have food allergies or hayfever. We will be much more careful with what plants we use in the future! Thanks for this information and sorry to hear about your children. Its interesting to note that this happened in Yorkshire, quite far North in UK terms. (See comments/thoughts on this above). Knowledge, often hard-won, both shields us from harm and opens new opportunities. I am a horticulture part time student (back to it in September!) and gardener. I am very interested in the hogweed issues, and it’s that time of year again, with Giant Hogweed hitting the news today. Now then, Mum was gardening 2 weeks ago without gloves on…weeding…we live in Devon/Cornwall. A spectacular blistering rash developed on both palms necessitating medical attention. The rash has steadily worsened, spreading to chest, abdomen and thighs over the course of 4-10 days. Hogweed has been implicated but no proof. My question is this, can the phytophotosensitisation affect even those areas not contacted by the offending chemicals in the plant sap, effectively spreading? I wondered as this might lead to confusion in diagnosis? As I understand it (and i’m far from being a scientist! ), the sap acts on contact, so shouldn’t spread. This isn’t to say that your Mum hasn’t had a further reaction – like a celery allergy or similar. See Monica Wilde’s article above for more info. I hope she is OK? I wouldn’t recommend them. I know some (experienced) foragers that have looked into food uses for them. Haven’t heard any positive reports. But they are all still alive! I was burnt all over my arms and legs 3 years ago by strimming common hog weed, im in stoke on trent, we on earth people say this horrible plant is safe to eat when it causes so much pain i will never know.Peolpe really need to understand just by touching this you can get burnt, as for eating it well, thats just silly. I still have problems going out in the sun now. Your own fault for murdering the plants. Reminds me of my sister touching an electric fire! She was only 1-2. Learn something about what remains of nature before destroying it! I have lots of giant hogweed on my property in Canada and have eaten small amounts in season without any photosensitizing. The seeds are delicious! Thanks Brenda – that’s interesting. I’d be interested to hear more about your experiences eating giant hogweed. It has no hairs on it’s stem and the leaves are not spikey. I tried to eradicate it two years ago and it has reappeared. I think i’d be accurately identifying it first. If it is giant hogweed and its bordering the path, some remedial action may be sensible. There should be no issues with common hogweed – its a super-abundant plant and a war with it will never be won. I had my first taste of common hogweed a couple of weeks ago – it was definitely an experience!! We steamed a flower bud, not quite opened, to see what it was like. I’m glad you are exploring this amazing plant. I only eat the young shoots before their leaves have fully unfurled (as pictured above). This is for reasons of taste, and to avoid while the plant is photosynthesising more strongly, with associated higher level of fouranocoumarins that can cause adverse reactions. Similary, only the unfurled green flower buds, again, as pictured above. Height and width aren’t especially useful as much depends on just where the plant is growing. Some never get bigger than a foot or two, some very young shoots can be very fat. You just need to spend some time tuning in. Thanks for this Mark. I have referred to your page many times whilst learning about hogweed. It has been a huge help. I would like to point people towards a blog i just wrote with some additional photos which I hope might be of use to anyone trying to identify the plant. I was really worried about identifying hogweed and wanted to add additional resources for anyone in the same boat. Thanks Liam, some great detailed pictures there. Your approach of actively seeking out scary species is a good one. Familiarity with giant hogweed, hemlock and hemlock water-dropwort keeps us safe and gives us confidence with the edible species – imagining a few less demons! What a wonderful website! I’m enjoying wild garlic, nettles, dandelions, wood sorrel swee cicily and more right now and for the first time tried common hogweed. Stupidly I relied on memory and ate it raw. 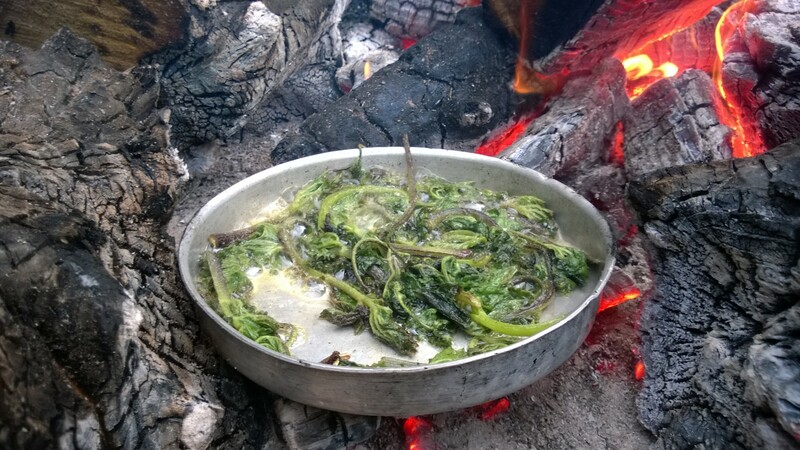 My experience of this was that it was utterly delicious, probably the most delicious plant I have eaten straight from the forest floor. However a mil tingle/irritation occurred on my tongue for an hour after. All gone now but having done further reading I see the advice is to cook it first. I have been collecting and eating wild foods for over a decade and cannot believe what a silly mistake I made by not double checking first. I’ve just come across your website whilst checking my identification of common hogweed. Fascinating stuff, thank you. The cows absolutely love the hogweed. It’s mature, so 5′ – 6′ tall, and they go from plant to plant, pushing through the other vegetation to get to them. They them strip all the leaves and tops off each plant, leaving just some stalks a couple of feet long sticking out of the ground. It’s great to watch and their enthusiasm is encouraging me to taste some too! Hi Mark, thanks for the informative post. I have just picked (end July, Dunbar) some green seed pods from what seems to be the most abundant weed over here, common hogweed. I had a little taste raw and I can see that this is really powerful stuff whose flavour I could easily do more with. I am a little troubled by the bitterness so I plan to de-botterify them and then brine them like people do with caperberries in Greece where I am from. The flavour reminds me of raw caper buds in that you can taste the goodness but a bitterness kicks in and spoils it. So the process I use with capers is soak the buds for 5-6 days changing the water regularly and then making a vinegary brine to put them in. Is there anything in this process that, in your opinion, might spoil the flavour or be dangerous? Hi Giorgos, sounds like a great idea. I pickle mine in a basic 3:2:1 solution – 3 water: 2 vinegar: 1 sugar (I use a pre-infused strong sugar syrup for this 3rd element – often with wood avens root) – plus any aromatics I fancy. The sweetness tempers the bitterness, though I have to say, I quite like some bitterness in my “flavour-bombs”! I’ve been eating a fair bit of hogweed the last couple of years ,it’s very moreish once you have a taste for it , I usually cook the leaves from the young stems until nearly crispy as well as eating the stalks ,I gave a small portion to a friend and she loved the taste but a while later felt that she developed a mild histamine reaction in her mouth and gullet, but it went when she ate some other food. I’ve never had any skin reaction personally. Visited your website after hearing a talk about foraging on the Food Programme. Many years ago (1970?) I was a botany demonstrator at Newcastle when there was a widespread panic about Giant Hogweed which I saw growing in vast stands on river banks. There was a drive to clear it all out as children were tempted to use the 2″ wide stems as ‘telescopes’, with unfortunate serious consequences. Later, while teaching in Somerset, we had an enquiry from the local Council about a boy with blisters on his arms. On visiting the site (a local viewpoint), the only likely Umbellifer I could find (the name changed to Apiaceae after I did botany) keyed out to Wild Parsnip. However, you mentioned Hogweed is rather variable so perhaps this could have been one of the subspecies. This summer (June) I’ve been inspired to search a little more as whilst driving through a copse on a minor road (but a main route in rural Somerset) we passed a verge with abundant (normal) Hogweed plus one specimen of Giant Hogweed. The difference was striking: normal Hogweed was up to 5½ ft high but the Giant was easily 12ft, dwarfing my wife at just over 5 ft! Later (mid July), the Giant had been hacked down to the ground, so maybe somebody wasn’t taking any chances. There was also another, shorter specimen 50 or so yards away which seemed intermediate, and according to the source I’m using (Stace’s Flora of British Isles) hybrids do occur, mainly around SE Scotland and London area. I also see that the ‘seeds’ differ in that the Giant Hogweed has oil glands slight swollen at one end, while the outer ridge of the seed may be slightly hairy. As you say, Mark, the answer is education, but sadly this has mostly fallen by the wayside, along with most people now living in towns. However, there is one simple principle to avoid problems when faced with ANY form of wildlife – treat it with respect and don’t tangle with it, especially if you don’t know much about it, but don’t injure it unnecessarily. Remember, whatever one comes across has as much right to be here as you and has had many millions of years to develop forms of protection: you don’t eat fresh Nettle or Foxglove leaves or Puffer Fish with impunity! If you carefully read this post and the thread above, it should shed light on most of your questions. In all cases their are a large number of variables in the plant (eg. stage of growth, phenotype, soil conditions, part touched), circumstances of exposure (e.g.. midsummer, noon, sunny day, length of exposure to sap etc) and the human encountering the hogweed (e.g. skin type, predisposition to sunburn, part of skin exposed etc). None of this makes the young shoots any less good to eat when cooked. Thanks for your very informative post. I’m a Persian food blogger. Ground hogweed seeds (heracleum persicum) is a very commonly used spice in our kitchens as well as in our traditional herbal medicine. We also pickle very young shoots and leaves. I’ve never had or heard of anyone in Iran having trouble with hogweed. Here in the UK (Berkshire) there’s hogweed everywhere but the plants are much smaller. Yesterday I picked some green seedheads and flowers and want to pickle them. I’m planning to write a blog post about hogweed’s culinary uses in Persian cuisine soon. I’ll put a link to your article for my British readers if it’s OK. By the way, I’m so glad I stumbled on your blog. It’s amazing! I’m a quite a good forager but don’t know as much about UK plants so it will be really useful for me. What’s it got to do with Hogs? ?